Home»An Assessment of the critical financial, human, and institutional capacity issues affecting agricultural research in West Africa. 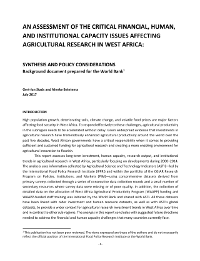 An Assessment of the critical financial, human, and institutional capacity issues affecting agricultural research in West Africa. Well-developed national agricultural research systems and adequate levels of investment and human resource capacities are prerequisites in the attainment of agricultural development, food security, and poverty reduction. Some encouraging signs indicate that West African countries have become increasingly focused on investing in agriculture for economic growth in recent years. Many countries have developed solid agricultural development and financing plans to strengthen agricultural production and food security as part of the CAADP implementation framework. Despite this increased political support to agricultural research, West Africa is still severely lagging behind other parts of Africa in the area of agricultural research capacity and investment. Underinvestment in agricultural research in West Africa is considerably greater than in other parts of Africa, the subregion is more dependent on volatile donor funding, and it employs both a much older pool of scientists (many of whom are approaching retirement age) and fewer female agricultural scientists. Furthermore, West Africa is severely challenged in terms of research infrastructure. Outdated research equipment and facilities are impeding the performance of productive research, which compromises the number and quality of research outputs and ultimately translates into reduced impact. Since 2008, WAAPP has injected a significant amount of funding into West African NARS. The program has made substantial progress in addressing the subregion’s most acute agricultural research challenges. It has invested extensively in the construction and rehabilitation of research infrastructure for predefined priority commodity areas and in providing adequate laboratory equipment. Another major achievement of WAAPP has been the investment in postgraduate training of more than 1,000 young scientists across West Africa—30 percent of whom are female. As such, looming large-scale human capacity losses due to the retirement of senior researchers are being offset. This extensive WAAPP investment in infrastructure and staff training has considerably strengthened the position of West African countries to perform high-quality priority research over the coming years. This report assesses long-term investment, human capacity, research output, and institutional trends in agricultural research in West Africa, particularly focusing on developments during 2000–2016. The analysis uses information collected by Agricultural Science and Technology Indicators (ASTI) and the World Bank.